The view from the away fans platform is superb! Call this a decent view? I’ve been thinking about this, and after the last visit 6 October 2018 I have to say the view for away fans on the elevated platforms is absolutely superb! After a few years of being critical of Watford for poor facilities, yesterday was the day when the experience was such a huge improvement. I had a ticket for the platform behind the goal. Its not one, but three levels, each of which is reached by a lift, as shown in the two new photos. Entrance to the stand is through the gate to the rear of the stand. The position is smack bang behind the goal. Superb! There is also a pitch level platform down the front. The toilet was roomy enough, though I didn’t see a Changing Places loo, there might be one. Well, the new Watford club shop looked nice. Clearly money has been spent somewhere. Where it hasn’t been spent is on improving facilities for disabled away fans. Yes, they’ve got rid of a wall, meaning that five (what a derisory number) away supporting disabled wheelchair users can get in. To be honest though, the ‘view’ (see the photo) wasn’t really worth the fee, and I spent more time watching the game on the big screen than I did the actual event. My view was constantly interrupted by photographers, stewards, police and one Watford ‘fan’ trying badly to land a punch. 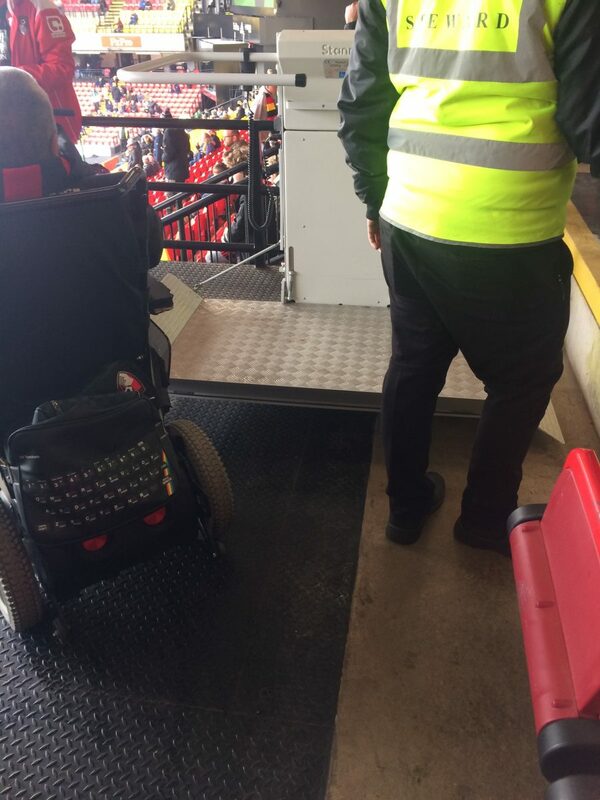 Seriously, I don’t know how much Richard Scudamore gets paid to do his job, but its about time he left his luxurious confines at football matches and came and saw how badly disabled fans are still being treated. “Thank you for your emails. Further to your previous enquiry I confirm that the North stand (Elton John Stand) is currently being extended to the north east corner, this will mean that the final provision for wheelchair users will be worked out against the final seating for spectators for the stand as a whole. The provision will include the removed 11 wheelchair spaces. The club have written to me to confirm that this provision will be available prior to opening next season. The location of spaces will be on an elevated platform rather than ground level. I am presently in contact with the club to establish a completion date. I am aware that there has been a delay in the programme of works where works have halted”. On the face of it, and given how long its taken for AccessAdvisr to extract this information, this seems like good news. However, we’ve seen enough false dawns already. We’ll keep you posted until the right outcome is acheived. I visited Watford as an away supporter. I was advised by my club to look for a person with a green jacket for help (a Watford employee). I explained I was an away fan and told to look out for the “help”. The lad was chatty well to my pa we had a good 4 minute walk round the stadium to the only step free access point. We was then guided in via the entrance and went all down the side going into the dug out! We then reached the away end! There was a ramp (didn’t look that safe) up on to a platform area by the corner flag, if u forgot your breaks you’d have been having a close up to the media bored! A Man from the foundation came and took drink and food orders which he delivered at half time, I can only assum therefore that it’s not accessible for wheelchair users. A lady wanted the toilet but no one seemed to know where it was, is there an accessible toilet? If it’s the other side I’d not fancy going in the dug out during the game! Q:When was the new stand signed-off for use? Q: Who, or which role, authorised sign off? A: The works were authorised by the Safety Advisory Group for Watford Football Club which includes Building Control representation within its body. Q: Why was the new stand signed off when it was not ready for disabled supporters? This in effect contravenes the Equality Act and presumably building regulations? A: Fully wheelchair provision was in place at the front of the stand at the time of signing off the works. I should mention that the Equality Act is not enforced by the Local Authority or the Safety Advisory Group. Works at the Watford ground have been continuous since 2014 and are still on-going. Q: Why has there been an unnecessary delay in allowing the full complement of wheelchair users into the new stand? A: I am informed that the club took a decision to install seating to the front of the new stand during the close of the 2015 season causing the removal of wheelchair spaces in this area. Seats for partial sighted supporters were retained. The Safety Advisory Group were advised that replacement wheelchair spaces would be provided in the North East corner by the start of the 2015/16 season. This has not materialised to date. There has nonetheless been a constant program of building work which continues to date. I should also mention that Building Control has no power to dictate the completion date of a building project. Q: How many wheelchair users in total will be able to use the new stand? A: This is still to be determined as I believe the club were still below expected standards even prior to the works started in 2014. However I have been made aware that all requirements for disabled facilities must be met by Premiership clubs by 2017. Q: What date will this issue be resolved? A: The club have been in negotiation with the Safety Advisory Group confirming that that full wheelchair provision will be re-instated on completion of the North East stand. Construction of this stand is currently in progress with a target completion being envisaged prior to the start of the next season. Further to the above I confirm I have written the club to demand a firm date for reinstatement of wheelchair facilities and I will seek clarification of the final provision as a percentage of total seating within the stadium. I will look to have a response within the next 14 days, no response may ultimately lead to enforcement action under Section 35 of the Building Act 1984. The following is a copy of an email sent by AccessAdvisr to Watford Building Control on April 18th as requested. AccessAdvisr is awaiting their reply. “I have been given this email address from your Twitter Account to follow up concerns regarding the development and opening of the new stand at Watford Football Club. I have been making enquiries on this since 2014, before the stand was opened. I have started to get some answers from Watford, but there are still a number of points which concern me. I hope that you will be in a better position to address my concerns. When was the new stand signed-off for use? Why was the new stand signed off when it was not ready for disabled supporters? This in effect contravenes the Equality Act and presumably building regulations? Why has there been an unnecessary delay in allowing the full complement of wheelchair users into the new stand? How many wheelchair users in total will be able to use the new stand? Why was the new stand signed off when it was not ready for disabled supporters? What date will this issue be resolved? “The Sir Elton John Stand was opened last season. We have extended the stand during the current season and this extension contains a platform which will make provision for another 11 wheelchair spaces. At present, we are unable to use these spaces as building work continues in the area behind the new platform – work that includes provision of an accessible toilet and a platform lift. We aim to complete these works during the summer, and already have a waiting list of regular supporters who wish to trial the new platform at the start of next season. 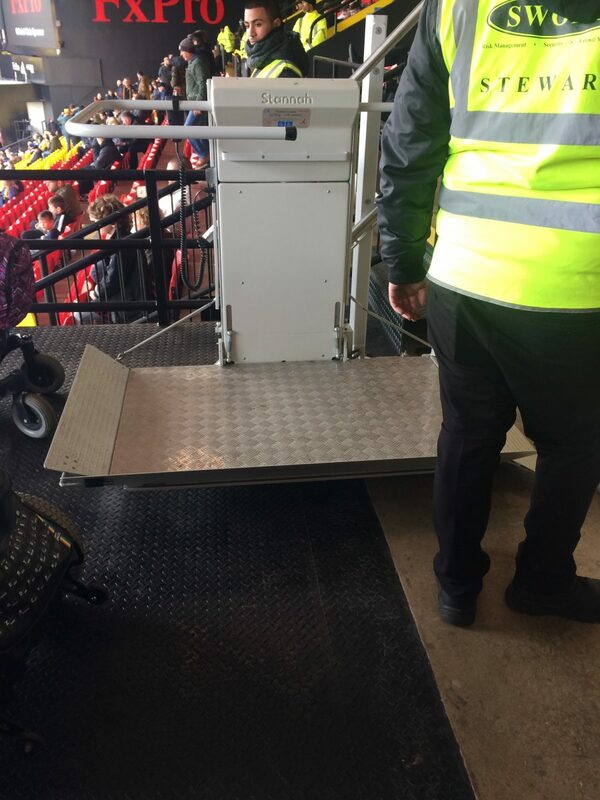 As the guidelines contained in the SGSA’s accessible stadia literature are based on the total stadium capacity, we are comfortable that the new platform will provide sufficient access to the Sir Elton John Stand for wheelchair users, as well as ambulant disabled supporters. Like all Premier League Clubs, we are fully committed to meet the requirements of the SGSA’s accessible stadia guide by August 2017. While the age of the Vicarage Road stadium means we have a lot of work to do, we are working closely with both the Premier League and our own Disabled Supporters Association, the Watford FC Enables, to ensure we are in the best possible position by the agreed deadline. The Enables website details all of our provision for supporters with all types of disability and I invite to you browse the site for details”. AccessAdvisr is not sure all questions have been satisfactorily addressed, particularly concerning the delay in readying the stand for disabled supporters. We will be watching with interest…. “We have been contacted a number of times about the current and proposed facilities at Watford. As you know we visited the club ourselves and we have spoken to them several times since – but we have not been able to confirm a definite final number of wheelchair user spaces once the redevelopment work is complete. the… Premier League… have also visited the club. Unfortunately they too were unable to confirm the numbers but we are advised that they are working with all their clubs, including Watford, to meet the minimum number of wheelchair user spaces by August 2017”. If the development isn’t complete then why have they opened the stand, and why are 5 paces available for away fans but none for home fans. It really is incredible that the self-styled ‘family’ club are taking so long to add the number of additional wheelchair spaces. It is also another example of the Premier League not taking the issue of accessibility seriously. 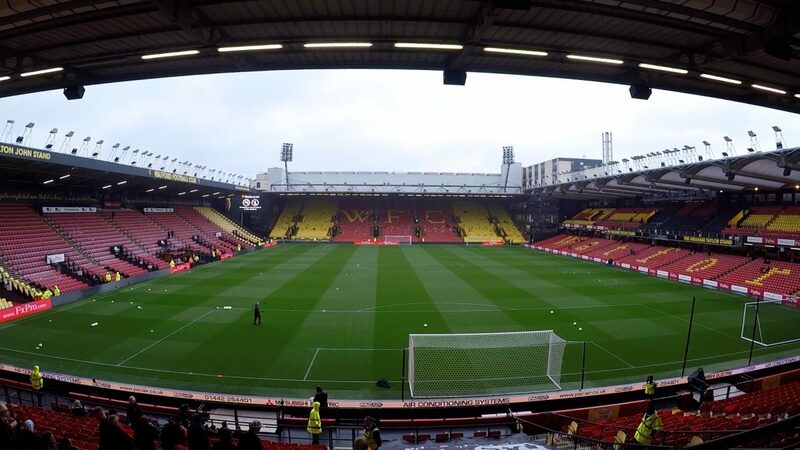 With building legislation nowadays making accessibility a legal requirement, it’s difficult to understand how a new stand can appear at Watford which has around 3,000 seats for able-bodied home fans but only space for 5 wheelchair users, and all of those supporting the away team. “Level Playing Field” is a group that focuses on accessibility at sporting venues, and “acts as a campaigning and advisory organisation to its membership and other parties across all sports”. They are run by a small team and have great difficulty keeping track of new developments, so hopefully this report will be of use to them. Watford were very helpful in arranging car-parking (£5), but on arrival we were told we were too early (about an hour) and would have to either wait (fair enough) or find temporary parking for a while (also reasonable). We parked eventually at Watford Junction rail station for free and decided to remain there. After a great meal at L’Artista (see review at https://accessadvisr.net/place/view/22390) we went to the ground. Helpful stewards directed us down the outside of one stand, into the ground and then all the way back up along the pitch to the viewing position. I initially thought that Watford’s disabled wheelchair users might occupy the pitch level positions, but these were taken up by photographers. So, unless a number of others arrived after me, I was surprised to find that there were only 5 away supporting wheelchair users at pitch level in this new stand. Before the game, a steward helpfully took our food/drink orders for half time. Then at the break we had to make our way once again past the photographers just to get to the accessible toilets. 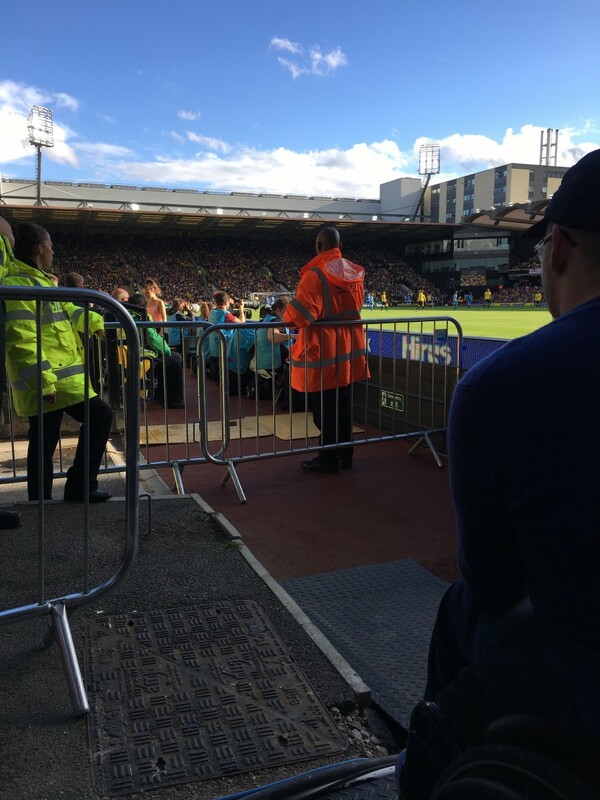 I have been in contact with Watford about this stand since Spring 2015, and they have been extremely reticent to say when there would be more spaces allocated to wheelchair users. For a club that supposedly prides itself on being a family club this is very puzzling. I couldn’t fault any of the staff. Everyone, from the car-parking staff to the stewards in the ground were very helpful. However, I have to say that Watford don’t seem to be playing ball when it comes to providing more and better facilities for disabled fans.